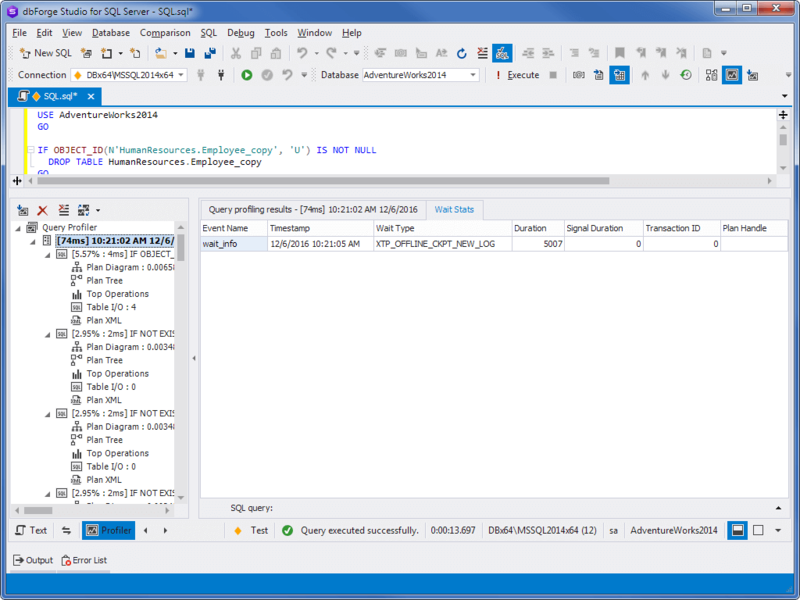 dbForge Studio for SQL Server delivers query profiler — a visual tool for tuning query performance that includes the MS SSMS counterpart's functionality and offers additional features to make developers and DBA's work easier and more efficient. This feature helps to visualize and tune query execution plan by pinpointing the slow-executing nodes. 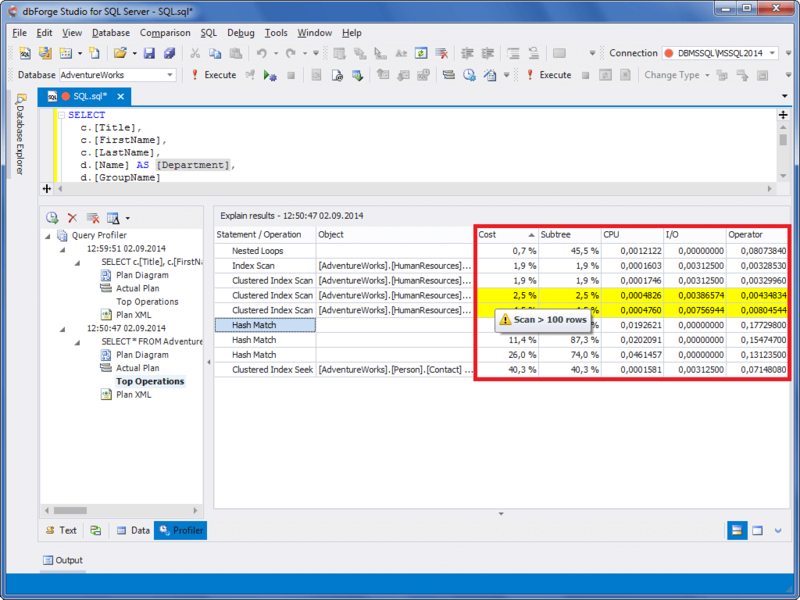 Each query in the batch that is analyzed is displayed with the cost of each query as a percentage of the total batch cost. Hover the mouse over a node to see its info. With the Wait Stats tab of Query Profiler, you can easily detect potential bottlenecks in your query. The tab displays a list of events and waits associated with them. Displays EXPLAIN results returned by the executed query. 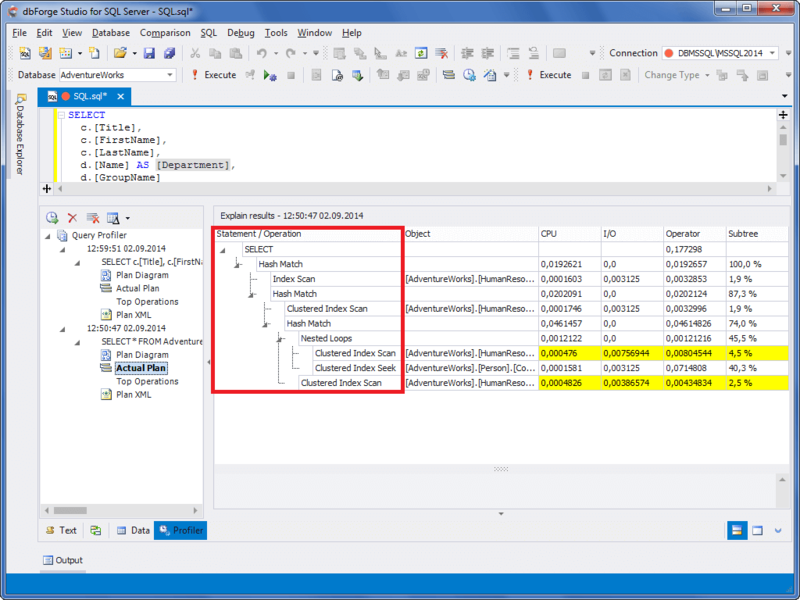 Use the Plan Tree tab to get information on how SQL Server executes a SELECT statement. It indicates positions where adding an index to a table, optimizing tables joining, etc., could increase SELECT performance. 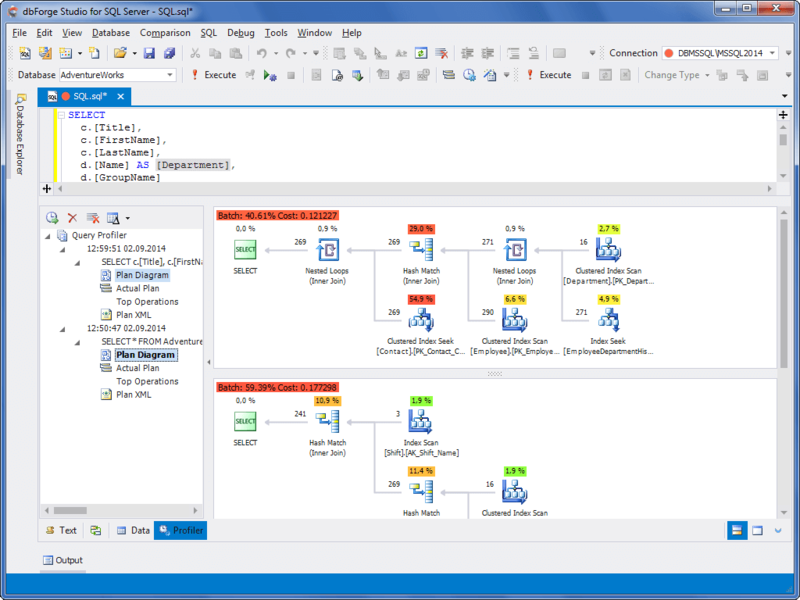 Allows you to quickly view the most expensive operations and optimize SQL code accordingly. Sort the list by CPU, I/O and other costs to get a demonstrable picture for your convenience. By default, sorted by the highest estimated cost. Query Profiler also includes the Table I/O tab that represents the input-output statistics for all tables involved in the execution plan. 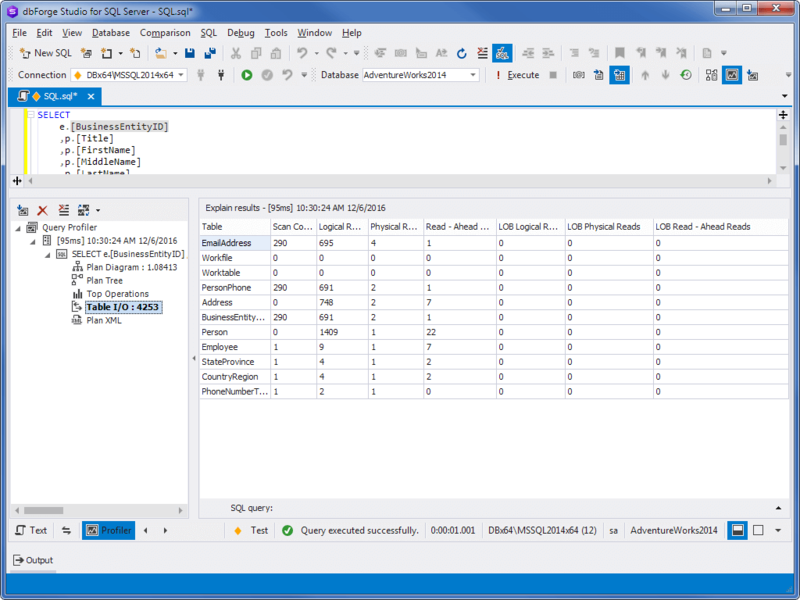 The key point in SQL queries optimization is seeing the differences in profiling results after you change your query. Select profiling results for multiple query executions and get the differences highlighted in the grid. 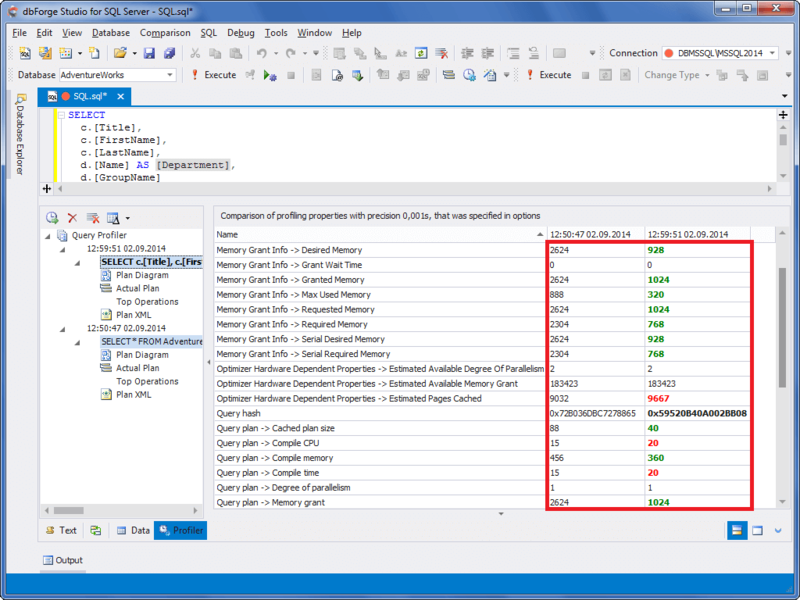 Compare general results of query execution as well as session statistics for each query execution.